This post is all about Xinaliq, or Khinaluq and how to visit this remote part of Azerbaijan. Xinaliq is not the easiest village to visit and getting there as an independent traveller is a bit of an adventure in itself. A while ago I read an article from the BBC about the highest village in Europe and the people that live there who claim they are descendants of Noah (aren’t we all if you believe the story?). In Xinaliq the people are indeed quite different from the rest of Azerbaijan. They speak their own language called Ketch, that is not related to any known language family, and they follow a combination of traditional animistic beliefs and Islam. Obviously after reading this article I wanted to go there. 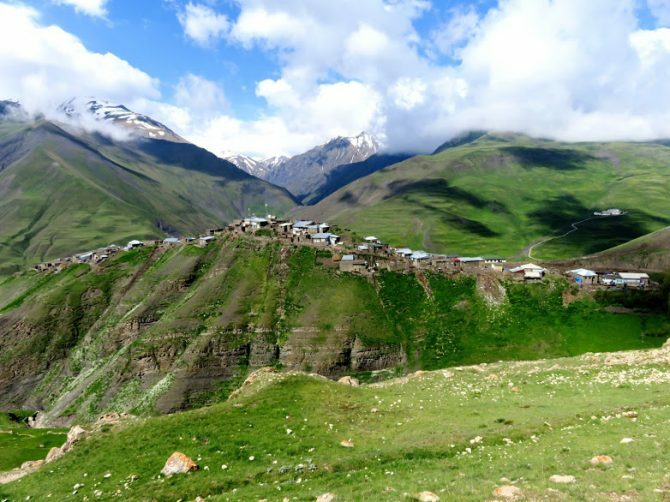 Not only to get a glimpse of this unique culture, but also because of promises of outstanding natural beauty in the Caucasus mountains close to the Russian border with Dagestan. After seeing all the pollution around Baku I was longing to see a different side of Azerbaijan. Baku’s center might be all modern, but this stops at the bus station. No more glitter and glamour for those who want to leave Baku. The bus station is a chaotic mess of hundreds of old minivans that only leave when full including extra folding chairs in the aisle. Only an hour out of Baku the scars of the oil exploitations diminish. The desert slowly changes into green rolling hills. Quba is as far as public transport goes. For the more remote mountain villages like Xinaliq you are lucky to find a shared taxi, but they take a long time to fill up. I found a driver who was willing to bring me there for only 30 manat. It is a 2 hours journey over difficult mountain roads, but the views are spectacular. My driver was a friendly smiling man who drove like crazy. At times I feared my life as he ignored the potholes in the road and the cliffs next to us. Even tough it is ramadan he was also trying to find out if i was in for a night of vodka with one of his friends in Xinaliq. I had to dissapoint him, but then it turned out his friend was running a guesthouse. My driver assured me that despite the vodka offer they were nice people and good muslims. It sounded a bit dodgy so I reluctantly promised him that I will take a look. His friend was funny indeed. He was overexcited to meet a young woman travelling alone and if it wasn’t for his lovely kind wife and children I would probably not have stayed there. The man turned out allright, although I suspect a mild case of ADHD. He also looked much older than his age with his dark skin wrinkled from all the years herding the sheeps in the mountains. With his wife present the vodka bottle was never mentioned again. She prepared a delicious lunch for us of fried potatoes and fresh fish from the river. After the lunch I got the obligatory tour through the village and the small ethnographic museum. The houses are simple and sober made out of dark greyish rocks. Most of them have no running water. It’s a peaceful place with more chickens, sheeps and horses than people. Even though it was already June it was still bitterly cold. I can only imagine how hard life must be in the harsh winters. As the sun sets over the mountains dark clouds gathered above us. We quickly went back home and we were just in time before a thunderstorm broke loose. The village disappeared in the fog and dark while I was given a warm cup of tea. There was no respite for the family though that headed back out in the rain to gather their sheep. When I looked out of the window I couldn’t see anything, but I heared the sheeps bleating. The family was running around with flashlights and sticks to chase all the sheep in a shed under the house. Then it was time to milk them and their two cows. It was already 9 pm when the work was done and we all gathered for a delicious meal. The next day i just wanted to relax and enjoy the scenery by taking some short hikes around the village. It took quite a bit of effort to convince my host family I would be fine on my own, even tough i am a woman. There are some hikes to animistic shrines and the family showed me some pictures of a fire temple. I decided to follow the path up the mountain behind their house for a wonderful view on the village below. When I came back my host mother was making fresh bread filled with spinach in a tandoor oven. Despite language barriers she opened up to me a bit about the difficulties of living in the mountains, but how happy she was with her children. She spent the whole afternoon in the kitchen and when all the bread was done it was already time to bring back the sheep again from the pastures. Luckily the weather today was better and I saw several herds of sheep returning to the village with their owners and fierce guardian dogs that protect them from the wolves. The next morning the same driver came to pick me up again. Apparently there were much more mountain villages to explore in the area and I would have been glad to see them, but unfortunately time did not allow for it. My adventures in Azerbaijan came to an end and I had to get the nighttrain from Baku back to Tbilisi. From Baku’s bus station there are frequent minivans to Quba. Quba’s bus station is at the outskirts of town. You can walk or take a bus to the Xinaliq ‘bus station’ near the market opposite the Xinaliq hotel. There are shared taxi’s to Xinaliq (10 manat), but it takes a long time for them to fill up. You can negotiate your own taxi with some of the drivers. It will cost you between 30 and 40 manat, depending on your negotiation skills. They often have their own connections with friends or family in Xinaliq that are happy for you to stay there and the driver might offer you to come and pick you up again for the same price. I heard there are shared taxi’s back to Quba leaving at 7 AM, but I am not sure how reliable they are. If Baku is your next destination read more about Baku in my post on the best things to do in Baku and the best day trips from Baku. People in Xinaliq are happy to host you. I am sure you can turn up in the village and ask around for a homestay. Most taxi drivers have their own connections with friends and families. A homestay will cost you between 20 or 30 Manat. Prices include three meals. There are no restaurants, but the food that the family will prepare for you is pretty good. Facilities in Xinaliq are very basic. Most homes have no bathroom and the toilet is outside. I didn’t manage to figure out how to get there, but 5 kilometers from Xinaliq is the highest fire temple in the world at an altitude of 3000 meters. From what I have heard it is now a pile of rocks among an eternal flame. Other possible hikes are to the nearby village of Qalayxudat (11 kilometers) or Jek (13 kilometers). At last one can hike to another beautiful mountain village called Laza. This will take you a full day over a mountain pass and a guide is recommended. You will have to stay in Laza that has a road connection with Quba. A Taxi from Laza to Quba will be around 40 manat. It can get very cold in the mountains, especially when the sun sets. Bring some warm clothes with you and some sturdy pair of shoes, preferably hiking shoes. You get three meals a day, but if you go hiking I can advise you to bring some snacks. Also bring a water bottle with a filter or steri pen to refill. You can not buy drinking water in Xinaliq, although you will get plenty of tea at your host family. If you do bring in plastic bottles of drinking water be eco-conscious and carry them back out. There is no system to dispose of plastic waste in Xinaliq. At last bring basic toiletries, including toilet paper and sun screen. Even if it is cold, you will burn easily at this height and the toilet outside is most likely without toiletpaper. As a solo female traveller I had no problems in Xinaliq, despite it being a more conservative part of Azerbaijan. People see tourists regularly and are used to the fact that western woman travel alone sometimes. When I walked through the village most people kept to themselves and if anything I received a friendly smile. Xinaliq is no longer a secret. It is ironic that in the most isolated remote place of Azerbaijan I met more fellow tourists than in the rest of my time in the country. More and more people visit this small town and this has both good and bad consequences. The traditional way of life of the shepherds that live here is still the main atttraction, but tourism is an increasing source of income and changing Xinaliq’s lifestyle. Xinaliq is proud of its own unique culture and not everyone in this area appreciates the influx of tourists. Here are some tips to be a respectful visitor. Be conscious when taking pictures. Even though some specifically asked for their picture to be taken, most gestured they did not want it. My host family was ok with pictures, but asked me not to post them on the internet. Respect their culture and dress appropriately. Most people in Xinaliq are Sunni Muslims and they will appreciate it if you were decent clothes. I learnt about a completely new place today from this blog. I had never even heard this name before but it looks mesmerizing. Much different from the usual mountainous trails of Swiss alps internet is filled with and looks so much similar to the Himalayan trails. Thanks for sharing this. its very different from the alps and the himalayan as well. It was so green and the culture is very interesting. I love reading about places that are less traveled. I’m really interested in seeing Central Asia. Thanks for the great detail. I want to eat that pile of bread!!! Baku seems to the the only part of Azerbaijan covered in magazines, TV etc so I was delighted to discover this post. Xinaliq looks beautiful and you have certainly inspired me to look for further information. Well done. SO interesting that they have their own language and separate culture! I love how in depth you went about your time there and the whole adventure! You are quite the explorer! It was fun to read along on this journey with you. Fascinating that they’re believed to be descendants of Noah. A beautiful area! To be honest, I don’t know that much about Azerbaijan, other than a little bit about Baku. What an exciting country to discover, and what an adventure with that taxi driver! Better than a roller coaster, I’m guessing. Can you do the hike from laza to xinaliq on your own? Or is a guide required? Is there still a military post? because I read this on older posts? Thanks. This is the place for me!!!!! I would have missed it, if not for your detailed description.